The sustained high temperature strength of the TiA1-based intermetallics causes severe wear problems with most cutting tool materials due to the heat generated in cutting. The most suitable tool material for turning Ti-48A1-2Nb-2Mn intermetallic was found to be fine grain (0.8 to 1.0 µm) cemented carbide containing 94% WC and 6% Co. The effect of changing cutting parameters and tool geometry on tool life was investigated. 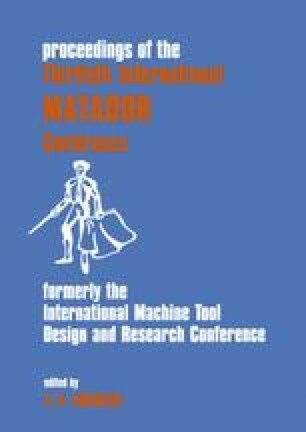 Tool life was much more sensitive to feed rate and cutting speed than in the machining of conventional titanium alloys and maximum metal removal rates were much lower. It was found that the tool life could be improved by using negative rake tools, but this was at the expense of surface finish. Tool failure was generally caused by flaking away of the tool edge and a strongly bonded layer, which was confirmed to be workpiece material, was observed on worn areas of the tool. Ti-48A1-2Nb-2Mn is extremely brittle and produces a powdery chip during single point cutting.